Kamlesh Prasad believes that there is no short cut to be successful in life or in any given genre. Mr Prasad is the director of Farmboy Fiji (FbF), a Nadi based subsidiary company of Prasad Agricultural Services (Fiji) Limited, a fruit and vegetable trader. This family run business continues to come highly recommended for providing including visiting yachts with the fresh supplies of fruits and vegetables at reasonable cost. Super yacht chefs and crew speak highly of the high level of service supplied by FbF whose business is rapidly expanding to manufacturing juices and pulps. Its services are also highly recommended and increasingly popular with yacht chefs – for both the local and overseas market place. As a Nadi Chamber of Commerce and Industry member, FbF carries a Fiji Growers License and passes regular Government inspections to ensure they supply only the highest quality of locally farmed produce. Their successful story came to life in 2000 when they started selling from their home at Fantasy Road in Nadi. He said, “We started from our home then went selling from house to house. First from the Nawaka Junction, to Votualevu Junction, to Namaka market then to the international market now,” Mr Prasad said. “We distribute to resorts, hotels, supermarket and the super yachts coming to Port Denarau including the owner of the Google. Mr Prasad started off as a farm boy growing up in their Sigatoka Valley Road farm on the east bank of Sigatoka River. In 1992 he was awarded the cane farmer of the year award. Few years later he was the youngest farmer representative in the Fiji Sugar Cane Growers in 1996. He was among the pioneers who introduced mechanical harvester in Fiji. “I learn my trade of heavy diesel mechanic on the farm, breaking and fixing our tractors. It was at the down turn of sugar industry when I thought to go into vegetable farming just as what my dad use to do. “We started to sell vegetables from the road side, and even went from door to door taking orders, supplying and selling. Earlier in October this year, FbF had a $50, 000 investments in construction and upgrading of a cold room storage. 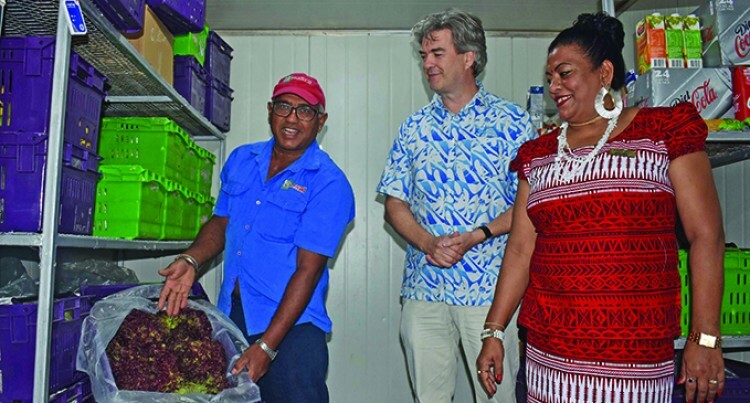 Tourism and retail sectors around Fiji now have greater access to more varieties of fresh fruits and vegetables thanks to this modern cold storage facility. It had upgraded the Fiji based company. It has improved their handling and storage of pineapples and watermelons assisting them expand its supply to the tourism and retail sectors. The cold room is part of the “Improving Key Services to Agriculture” (IKSA) agriculture and horticulture project, funded by the European Union (EU) and implemented by the Pacific Community (SPC) with about $35,000. He has upgraded the infrastructure by resurfacing the processing room floor, installing of air conditioning and upgrading their freezer and cold room storage, and setting up stainless steel tables to inspect and sort produce. This upgrade enables FbF to process produce and meet high quality control standards expected by clients. “We’ve got a lot of competition and there are more rules put in place by the Bio-Security Authority of Fiji (BAF). Enhance food safety management and product quality with an HACCP (Hazard Analysis and Critical Control Points) certification,” he added. He intends to continue working to support farmers in the sugar cane belt to increase and improve the production of horticultural crops through the provision of the enhanced research and extension services, nursery and farmer development, and improved market access and trade. Slowly he suggests to grow more fruits and vegetables through the provision of training, improved seed and seedling supply, and developing markets. Mr Prasad added that the project has shown that there are opportunities to replace imported fruits and vegetables, such as tomato, capsicum, broccoli and melons and grow exports of papaya, eggplant and root crops.